The cover is Gilbert text-weight cotton bond, paste printed with Liquitex Artists Colors Prism Violet & Phthalo Green in wallpaper paste and overpainted with acrylic Gesso, while still wet. The text paper is 25% cotton bond, light cockle Tourmaline by Fox River. All alphabets were done with a 1 mm nib, then reduced at photocopy. 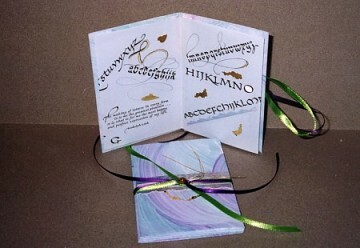 Book 3½″ x 5¼″ (8.3cm x 13.3cm). See her artist book in her own 1st Book Swap. See her artist book in her own 2nd Book Swap. See her artist book in her own 3rd Book Swap.